Same day return transfer up and back from Mt Baw Baw Alpine Resort starting in Moe. Save yourself all the hassle of driving up one of the most dangerous Alpine roads in Australia and let Mountain Top Experience take you to the snow. One way transfer up to Mt Baw Baw Alpine Resort. Save yourself all the hassle of driving up one of the most dangerous Alpine roads in Australia and let Mountain Top Experience take you to the snow. One way transfer from Mt Baw Baw Alpine Resort to Moe. 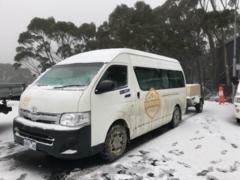 Save yourself all the hassle of driving down one of the most dangerous Alpine roads in Australia and let Mountain Top Experience take you home from the snow.